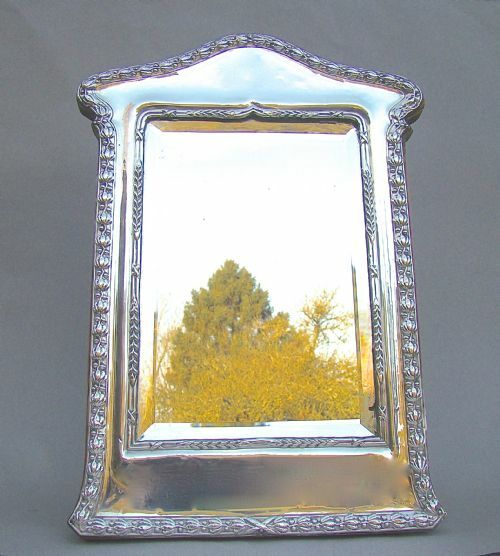 This highly decorative silver and bevelled glass mirror is dated Birmingham 1916. It is very architectural with its portico shaped oak easel. The shaped hallmarked silver mount is embossed with decorative Arts & Crafts motifs. Fitted with the original bevelled mirror. Light oak back and easel. Maximum Height: 31cm / 12 inches. Width: 12cm / 4.4 inches. Height: 20cm / 7.4 inches. Width: 14cm / 5.2 inches. Silver mount with surface pitting on the lower section. Mirror in very good condition. Original oak back and easel in very good condition. Postage overseas: £15.00 International signed for. 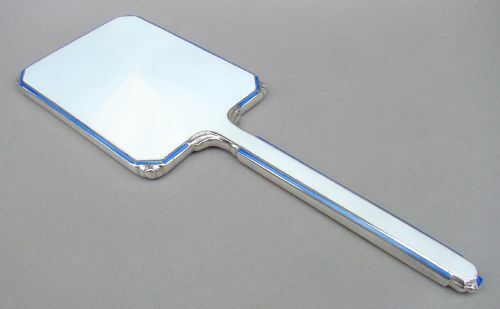 This fabulous silver & guilloche enamel hand mirror was made in Birmingham in 1935 by the prolific William Neale & Son. The unusual and stunning pale grey enamel back with sunburst patterns and stylised tulip. The front fitted with a bevelled mirror. WN LTD for William Neale & Son. Date letter "L" for 1935. The bevelled glass is in great shape without loss or black spots. The enamel back is in excellent condition. The silver handle in excellent condition. Length: 26 cm / 10.2 inches. 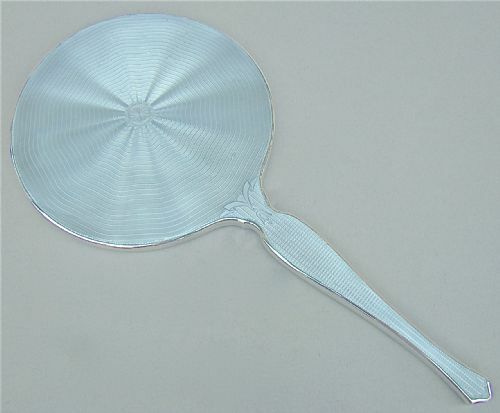 Mirror: 12cm / 4.4 inches diameter. 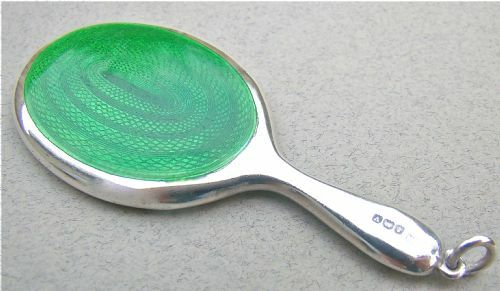 This fabulous silver & guilloche enamel hand mirror was made in Birmingham in 1922 by the prolific Adie Brotehrs. The unusual and stunning ensign has been patented and there is a patent number alongside the hallmarks. The viviv turquoise enamel back with sunburst patterns. The solid silver handle with an elaborate classical inspired design. A Bros for the Adie Brothers. Date letter "Y" for 1922. Length: 25 cm / 10 inches. 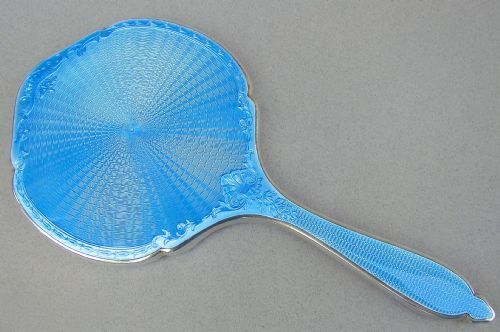 This exquisite silver and ivory and powder blue guilloche enamel mirror was made in Birmingham 1922 by the prolific Adie Brothers. It has an unusual and elegant colour combination. The pale oyster enamel back with sunburst patterns and bordered by powder blue enamel bands, The solid silver handle with stepped decorations, very much in the Art Deco manner. Length: 27 cm / 11 inches. Mirror: 8cm x 11cm / 4.4 inches x 3.3 inches. This exquisite silver and guilloche enamel mirror was made in Birmingham 1933 by The Adie Brothers. 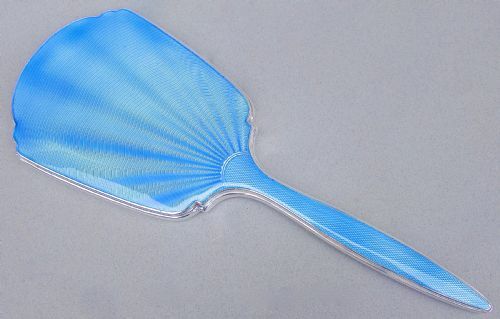 Of shaped oval form with an exquisite sunburst patterned powder blue guilloche enamel back. Date letter "J" for 1933. Length: 28 cm / 11 inches. Mirror dimensions: 10cm x 14cm / 4 x 5 inches. This stunning silver and guilloche enamel mirror was made in London 1930 by Richard Comyns, part of the celebrated Comyns family. 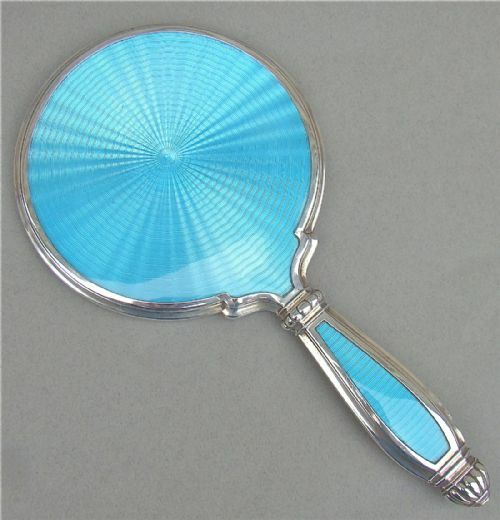 Of shaped circular form with an exquisite sunburst patterned powder blue guilloche enamel back. Traces of gilding at places. Original bevelled mirror. Date letter "p" for 1930. Mirror in good condition, two minor surface scratches, commensurate with age. Minor dent on a small area of silver border. Length: 23 cm / 9 inches. Diameter: 12cm / 4.4 inches. 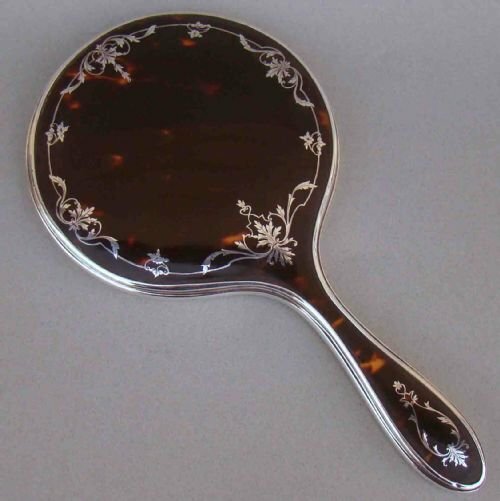 This fabulous silver & pique tortoiseshell hand mirror was made in Birmingham in 1925 by Wilson & Gill. Tortoiseshell back with a pretty silver piqué border with garlands of leaves and flowers. W&G for Wilson & Gill. Date letter "A" for 1925. The tortoiseshell back is in excellent condition, with just very minor surface wear conmensurate with age. The piqué inlay decorations are in very good order. This is a delightful silver mounted guilloche enamel purse mirror made by the renowned Crisford & Norris and dated Birmingham 1920. Of conventional form with a vivid green guilloche enamel back. The handle with ring attachment. Fitted with the original mirror. Date letter "v" for 1920. Length including handle: 7cm / 2.6 inches. Mirror in equally good condition.